All Saints Church is very fortunate in having a magnificent four manual organ, built by Hill and Sons and presented to All Saints by Charles Longuet Higgins in 1855. Originally powered by hand-operated bellows (still to be seen at the east end of the North aisle beyond the memorial to the second Baron Mordaunt and his wives), the organ was converted to electric pumping in the 1930s. Although considered "small" as four manual organs go, in only having 30 stops, All Saints' organ is well known and several famous organists have given recitals in All Saints. The organ has a fine, full tone, and its richly decorated pipes look beautiful in the three Purbeck marble arches in which they are set. 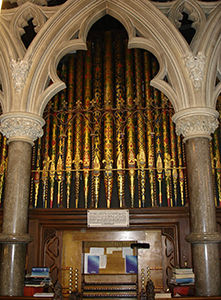 The organ is built over the Mordaunt family's former mortuary chapel of the North Chapel. "...built by Messrs Hill and Davison, ...constructed on the German scale, the manuals extending to C, eight feet pipe, and having a separate set of pedal pipes. The beauty of its tone, and excellence of its mechanism, received unanimous approval." However only nine years later, in 1847, a more elaborate three manual instrument was installed, paid for by Charles Longuet Higgins. Then in 1855, following the extensive remodelling and enlargement of the church by Sir George Gilbert Scott, Charles presented what was, effectively, a new and even larger Hill & Sons organ, incorporating material from the 1847 instrument. It was at this time that the fourth manual, consisting only of the astonishing Tuba Mirabilis, was added. For an indication of what the Turvey Tuba sounds like, read the article in the Northampton & District Organists' Association Newsletter, written following a visit by a group of organists to Turvey in 2013. A recent substantial bequest, specifically for the purpose of renovating the Hill organ, will enable us to attract visiting organists to give recitals and draw more people to the church. Follow the links on the left hand side of this page for more information about the organ and a photo gallery of images of the organ, inside and out.